The experimental cancer drug brivanib did not lengthen overall survival for patients with hepatocellular carcinoma, but it did increase time to progression, demonstrating that it had anti-tumour activity, researchers reported at the 47th International Liver Congress (EASL 2012) last week in Barcelona. Over years or decades chronic hepatitis B or C infection – as well as heavy alcohol consumption, hereditary liver diseases and other causes – can lead to advanced liver damage including cirrhosis and hepatocellular carcinoma (HCC), a type of liver cancer. HCC is often not detected until advanced stages and is difficult to treat. Sorafenib (Nexavar) is the only drug shown to improve survival in people with HCC who are not eligible for surgical removal, but some people are unable to tolerate it. Josep Llovet from the University of Barcelona and Mount Sinai School of Medicine and an international team of colleagues conducted a phase III trial to compare brivanib versus placebo in people with liver cancer who were unable to take or progressed despite using sorafenib. Brivanib is a selective tyrosine kinase inhibitor of vascular endothelial growth factor receptor and fibroblast growth factor receptor that demonstrated promising evidence of efficacy in phase II studies. The BRISK-PS trial enrolled 395 HCC patients in Europe (42%), Asia (41%) and the Americas (17%). Most (about 85%) were men and the median age was just over 60 years. All had tried sorafenib for at least 14 days, but had used no other systemic anti-cancer therapy. Nearly 40% had liver cancer secondary to hepatitis B, almost 30% had hepatitis C and about 25% had alcoholic liver disease. About 85% had advanced BCLC stage C HCC and two-thirds had metastasis; patients randomised to receive brivanib were more likely to have microvascular invasion of tumours into blood vessels. They generally did not have severely impaired liver function, however, with more than 90% at Child-Pugh stage A. Participants were randomly assigned (2:1) to receive 800mg once-daily oral brivanib or placebo along with the best supportive care. They were followed until they experienced disease progression or unacceptable toxicity. The primary endpoint was overall survival, but the researchers also looked at other outcomes including time to cancer progression, "disease control rate", "objective response rate", and safety. Brivanib did not provide an overall improvement in survival, the investigators found. The median length of overall survival was 9.4 months for brivanib recipients versus 8.2 months in the placebo arm, which was not a significant difference (p = 0.33). Further, no differences in overall survival were identified for any pre-specified subgroups stratified by type of liver disease, degree of functional disability, tumour size, blood vessel invasion and spread of cancer outside the liver, and whether they were non-responsive to or intolerant of sorafenib. Although the primary endpoint was not met, secondary endpoints showed improvement. About 6% of brivanib recipients and 14% of placebo recipients died within 30 days after the last treatment dose. Time to progression was significantly longer in the brivanib group compared with the placebo group (4.2 vs 2.7 months; p = 0.0001). Brivanib recipients were six times more likely to demonstrate partial response (12 vs 2%) and half as likely to experience disease progression (22 vs 44%). Almost all participants experienced adverse events, and most had serious adverse events, but these proportions were similar in the brivanib and placebo arms (63% and 57%, respectively, for serious adverse events). However, brivanib recipients were more likely to experience several events including decreased appetite, fatigue, high blood pressure and gastrointestinal symptoms. Investigators judged six deaths in the brivanib arm to be possibly related to the study drug. The researchers concluded that while "the primary endpoint of improved overall survival was not met...there were improvements in time to progression, disease control rate and objective response rate, indicating anti-tumour activity of brivanib". They added that "brivanib had an acceptable safety profile". In a overview of liver cancer research on the final day of the congress, Jordi Bruix from the University of Barcelona noted that while brivanib did not demonstrate a significant survival advantage in BRISK, it did delay tumour progression, raising the question of what types of response should be measured. Further studies of brivanib are currently underway. Kowdley KV et al. 97% RVR for PSI-7977 + PEG/RBV x 12 week regimen in HCV GT1: an end to response-guided therapy? 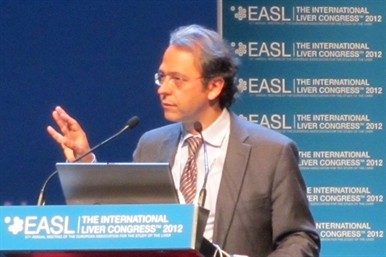 47th International Liver Congress (EASL 2012). Barcelona, abstract 1, 2012.